Children of Bodom in Montreal or Quebec City? Inform me about the next events for Children of Bodom. Enroll yourself to our priority waiting list for Children of Bodom to be alerted when new tickets are available. Filling this form doesn't engage you to any purchase. 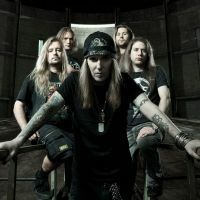 Children of Bodom will be part of the Heavy MTL festival on july 24th, 2011. The band will share the stage of the Parc Jean Drapeau with Kiss and Motorhead. The heavy metal band from Finland are playing since 1993 and have 6 studio albums.